A proper rangefinder is essential for hunters, birders, hikers, backpackers, and other outdoor enthusiasts. It will help you find the distance between you and a target, rare bird species, mountain pass, or another natural landmark. Without one, you’ll have to rely on guesswork, at best. Rangefinders today are highly technical and many are designed to withstand the elements on even the most ambitious of adventures. Our list of the Top Ten Rangefinders will help you sort through the best models on the market today to find the one that’s right for you. 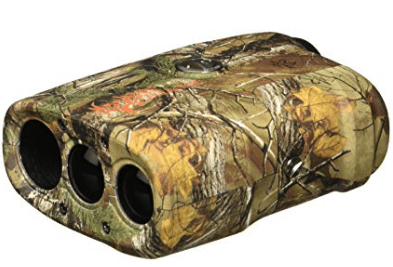 The ProWild is a hunting-specific rangefinder from TecTecTec. It’s capable of measuring up to 540 yards and offers a continuous scan mode, advanced speed technology, and a durable, water-resistant body design. This rangefinder allows you to take fast measurements. These measurements are accurate within one yard and the rangefinders’ through-the-lens display features premium, ultra-clear, multilayered optics with both distance and a battery meter. The Bushnell G-Force DX ARC rangefinder is vertically designed with 6x magnification. It’s great for either bow hunting or rifle hunting and it features Bushnell’s Vivid Display Technology red screen readout, which can be manually adjusted through four different brightness settings. This rangefinder also allows the user to adjust the intensity of the reticle and readout in order to meet their preferences in different lighting conditions. It also offers a ‘Rifle Mode’ that displays angle-compensated holdover readings in MOA or Mil, as well as holdover in inches or centimeters. The Leupold RX-1200i offers a huge range from 6 to 1,215 yards. It’s a great rangefinder for rifle and target shooting with 6x magnification and a 22-millimeter objective lens. It boasts both LED and red displays and relatively compact, with dimensions of 3.8” x 1.4” x 3.0”. This rangefinder also offers True Ballistic Range (TBR) technology with a built-in inclinometer. This technology provides four distinct readouts: HOLD, MOA, BAs, and Mil. Finally, it includes three reticle options and is designed to be both waterproof and fog proof. This Leica Rangemaster is an ideal starter model for archery and hunting. It measures both linear and horizontal distance and provides 7x magnification with 24-millimeter optics and integrated diopter compensation. This rangefinder also allows for precise targeting and flexible application while boasting an innovative, clear LED with automatic brightness control. Its wide field of view makes it a great entry-level rangefinder for discerning beginners. The Ranger 1300 from Vortex Optics is an easy-to-use rangefinder that boasts a clean, illuminated display and a highly intuitive menu. It’s capable of ranging up to 1,300 yards, which makes it an ideal solution for the majority of hunters and shooters. This rangefinder’s primary HCD mode displays angle-compensated distance. It also offers an advanced LOS mode that provides the user with the option to calculate long distance, high angle shots with increased precision. It also offers a scan feature that gives a continuous range as you pan across a landscape or tracks a moving target. The Bushnell 202208 Bone Collection’s weather-resistant housing makes it a great rangefinder for hunting trips in the roughest of conditions. It is accurate to one yard, plus or minus, and offers a simple, one-button operation. This rangefinder boasts 4x magnification with a 21-millimeter objective lens. It is considered a Class 1 laser with <1mW average power output. Finally, it features crystal-clear optics that will literally bring you face-to-face with your next trophy. The Nikon 8397 ACULON AL11 is Nikon’s most compact laser rangefinder. With dimensions of 3.6” x 2.9” x 1.5”, it’s easy to take along on any trip, whether you’re gun hunting, bow hunting, or target shooting. This rangefinder boasts an uncluttered, easy-to-read screen that displays ranges in one-meter or one-yard intervals. It offers 18-millimeter eye relief and, as a Class 1 laser product, its power output doesn’t exceed .0975 milliwatts. Finally, this rangefinder has a measurement range from 6 to 550 yards. The Simmons Volt Rangefinder offers hairsplitting accuracy in a simple design. It has an in-view LCD display that provides exact distance to targets anywhere from 10 to 600 yards away at the tap of a single button. This rangefinder offers 4x magnification with bright, crystal-clear optics via a 20-millimeter lens. It also offers a weatherproof housing and a compact, vertical design that’s easy to carry anywhere and makes it even easier to carry out something much heavier. The Halo XL450-7 rangefinder is an exceptional tool for hunters of all shapes and sizes. Whether bow hunting or rifle hunting, the XL450-7 will give you accurate readings fast. It offers an eyepiece that twists for better focus and a CR2 battery that lasts nearly a year, depending on usage. This rangefinder offers 6x magnification and a 450-yard reflective range. It’s a Class IIIA laser with a power output of 5 mW or less. Finally, this rangefinder provides distance readouts in both yards and meters. The last model in our top ten list is another from our friends from TecTecTec. The VPRO500 is primarily a golf rangefinder, but its upgraded 2018 version is capable of measuring up to 540 yards and offers a continuous scan mode, advanced Pinsensor technology, and a durable, water-resistant body. This rangefinder also offers a through-the-lens display that provides premium, ultra-clear, multilayered optics with distance and battery meter. It is also lightweight and dust-resistant, which makes it an excellent carry option for golfers and hunters alike. Although most of the rangefinders we’ve highlighted here are designed for hunting purposes, there is an important distinction between them and rangefinders used for other purposes. This Buyer’s Guide will help you select the right rangefinder by focusing on some of the major factors that set the best apart from the pack. The major distinction in priority boils down to ‘first priority’ versus ‘second priority’. First priority rangefinders are typically classified as those widely used on the golf course. In these situations, there are generally zero obstacles between the user and the object they are targeting. Second priority rangefinders are those used for hunting. In these situations, the user is often in a blind or screened by some object between them and their target. Hunting rangefinders will ignore the first object in its line of sight and provide an accurate reading on the second object, which is usually your target. To be clear, first priority rangefinders can be used for hunting and second priority rangefinders can be used on the golf course. However, the product best designed for your intended use will be the best product for your money. Keep in mind that some laser rangefinders provide the ability to switch between ‘first priority’ and ‘second priority’ modes. Distance is one of the metrics that you have to be really careful about when shopping for rangefinders. Many manufacturers market their rangefinders with names that imply the maximum readable distance you can achieve with that unit. Many units, however, will only achieve that distance under ideal circumstances. If you’re an experienced hunter, you know that perfect conditions are rare. The opposite is more often the case, and in these situations, many rangefinders will only provide accurate readings at well under half of its maximum stated range. In most scenarios, it is best to seek readings at about one-third of a rangefinder’s maximum stated range. Certain rangefinders use reticles that are essentially black lines superimposed over the object you are ranging. Others have LED lights that are invariably adjustable. Deciding which is best can largely depend upon your preference, but here are a couple pros and cons of both. Black line reticles are useful in good lighting situations but they can often be indistinguishable against a dark background or in shadowy scenarios. LED reticles, on the other hand, are great in low light situations but can be drowned out by ambient light in bright conditions. These LEDs can also destroy your night vision when used in the evening. So, what’s the best of both worlds? There are several rangefinders on the market that offer black line reticles with a button for backlighting. This backlighting is typically much less harsh than LED lights and still allows you to view essential display information in all light conditions. Bradley A. Fiske is credited with the invention of the first rangefinder (1). Did you know that? Well, even if you did, our Frequently Asked Questions section will hopefully provide answers to a few more common mysteries surrounding rangefinders. A reticle is the crosshair (also known as ‘aiming point’ or ‘circle’) that you see when looking through a rangefinder. ‘Hold’ is the measurement for either above or under a target point (2). ‘MOA’ is the time measurement of the angle of elevation to get a zero for scope adjustments. ‘BAs’ is the equivalent horizontal range measurement. ‘Mil’ stands for milliradians of the angle of elevation to get a zero for scope adjustments. How much maintenance will my rangefinder require? Fortunately, rangefinders require minimal maintenance. The most important ways to maintain your rangefinder is to ensure that the optics stay clean and it is handled with care. How much range should I have? The answer to this question largely depends on how you intend to use it, but we’ll do our best to provide a general answer. For bowhunters, 100 yards is generally more than enough range, as you should be close to your target anyhow. If you’re rifle hunting, however, your desired range will depend on a number of factors, including where, what, and how you hunt, as well as your hunting style and proficiency. As you might imagine, factoring all of these unique considerations in means you’re probably looking at a range anywhere from 200 to 800 yards. When searching for a rangefinder, be careful to consider what the advertised yardage is relative to, as specifications can vary from highly reflective surfaces to deer-sized targets. What can I do if my rangefinder isn’t performing to the range specified? Unfortunately, some of the cheaper rangefinders on the market today simply don’t provide the quality you need. Before replacing it altogether, though, try swapping out the batteries for a fresh pair and see if that helps. If you’ve been using it for a long while, it’s always possible that a large impact compromises the alignment of the unit. If you suspect the latter may be the case, the best course of action is to call the unit’s manufacturer. Are laser rangefinders safe for my eyes? Yes! All laser rangefinders should be designated as Class 1 laser devices, which means the FDA approves them (3). Should I get a horizontal or vertical rangefinder? Again, the answer mostly depends on your preference. However, let’s break it down a little more than that. Horizontal rangefinders are generally wide and flat, which allows the user to steadily grip them with two hands when ranging a target. This makes horizontal designs a great choice for higher magnification and longer distance rangefinders. The only downside is that they’re generally bulkier than their vertical counterparts. Vertical rangefinders are perfect for carrying in a pocket or securing to your belt because of their compact design. When actually ranging a target, however, they can be hard to hold steady and the image can appear shaky. As a result, vertical rangefinders typically offer lower magnification than their horizontal counterparts. A quality rangefinder will take the guesswork out of distancing targets, whether you’re an avid bow hunter or you prefer to use a rifle. We hope that you’ve found the information in this article useful and we wish you the best of luck finding the right rangefinder for you!